Commercial drones are transforming nearly every industry with data-driven insights. These small autonomous aircrafts can fly around construction sites, over forests, and scale cell towers. With high-resolution photogrammetry, sensor data capture, and mapping capabilities, entirely new industrial applications using drones are possible. Predicted to hit $17 billion by 2024, the commercial drone market is already proven with uses that increase public safety and business and government efficiencies. Drone-generated data helps mining companies model inventory and measure movement of materials. Police departments use them to monitor crowds. Farmers use drones to examine crop conditions for disease and yield. Insurance companies assess storm damage on homes and buildings. Engineers use them to inspect bridges and wind turbines. As the commercial drone market takes off, we’ll see regulatory requirements evolve and adapt. Much like safe, connected and autonomous cars, drones will be required to have higher reliability, functional safety and security. Furthermore, seamless communications and secure authentication will be critical. Already today, components designed for autonomous and ADAS car systems can be used in commercial drones. NXP’s drone and rover solutions portfolio includes just that and more — automotive and industrial microcontrollers, processors, power management, security and authentication, networking, sensors interface, and RF power components. We have what’s needed to power UAVs safely, securely and reliably. 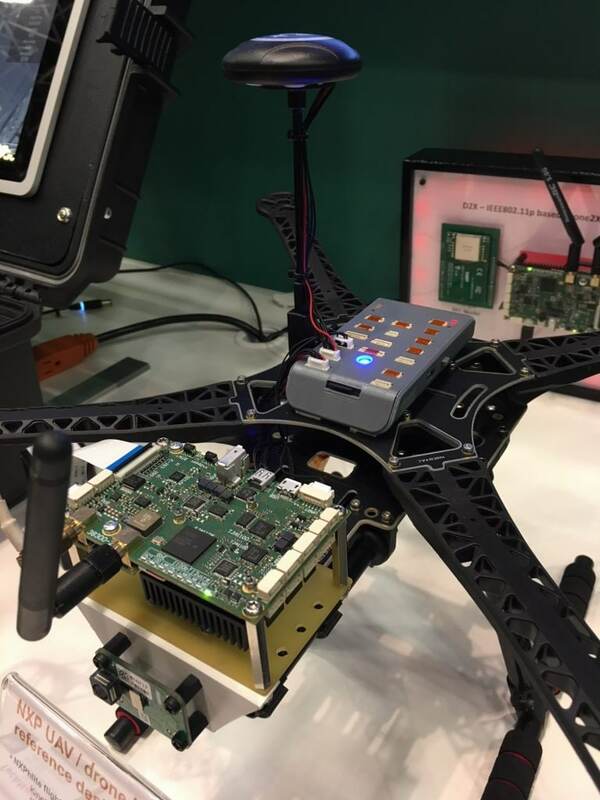 “Open source,” “safe” and “secure” all top the list of drone requirements, according to developers at InterDrone last week where it was announced that NXP was a new Dronecode member. NXP will bring its safe, secure automotive grade components for drones to the ecosystem, including a Flight Management Unit that runs the PX4 flightstack. Pictured above, our relentless researchers are testing IEEE 802.11p-based V2X communications technologies on drones. Why start from scratch and build apps that have already been built? To help commercial drone developers tap into the market opportunity and achieve faster development cycles, NXP became a gold member of Linux based Dronecode, the leading open source platform for UAVs. With Dronecode, developers leverage the “power of the crowd.” With so many eyes on the code base, it’s reliable and secure. And with an active community, bugs are fully transparent, understood and resolved. You have freedom to customize to your specific needs, without locked-in limitations of proprietary software. And, best of all, Dronecode is very business friendly with its BSD license. Now, with Dronecode, code re-use and code transfer to completely different apps is possible. For example, if you develop (or someone else developed) a battery management system for a rover — or maybe it was used on a power tool, or even a scooter — that same code can be re-used on a commercial drone. To meet demanding commercial requirements, Auterion provides fully managed commercially tested, certified and long-term distribution of PX4, which uses the same Dronecode base. They also provide tools for analytics and managed devices ensure safe fleet operations. Airmap is now pre-integrated with QGroundControl, a Dronecode groundstation planning software that’s compatible with our software stacks. Now developers can tap into mission-critical UAS Traffic Management (UTM) services. Advisories, pilot authentication, flight planning, compliance briefings, real-time traffic alerts and an alpha release of airspace maps can be accessed efficiently and securely. For example, connected drones can share live flight positions via AirMap for real-time feedback. Why are auto-grade components important for commercial drones? It’s clear that commercial operations will be running beyond visual line of sight (BVLOS), which requires functional safety and secure authentication solutions. This is where automotive components become a game changer. Experts from Auterion, Dronecode and more, weigh in. NXP’s automotive and industrial technologies power cars today and drive autonomous vehicles of the future – and those same technologies are used for industrial drones, rovers and other small autonomous vehicles. Now, with Dronecode, you get the power of the crowd with code re-use and code transfer to other applications. Start with us now, and build with us in the future.